Ruth works from her studio, based in Cardiff, where she produces a variety of kiln formed objects of vivid colour and depth such as bowls and jewellery, as well as free-standing and wall -mounted pieces. She continually experimenting and developing glass fusing ideas, techniques and colours. Designs can always be tailored to individual preferences for commissions. Inspiration is drawn from the colourful world that surrounds her and her affinity to the rich landscape and ever-changing beauty of the mid-Wales coastline. The vibrant palette of sea, mountain and beautiful scenery translate with ease into bright designs in fused glass. 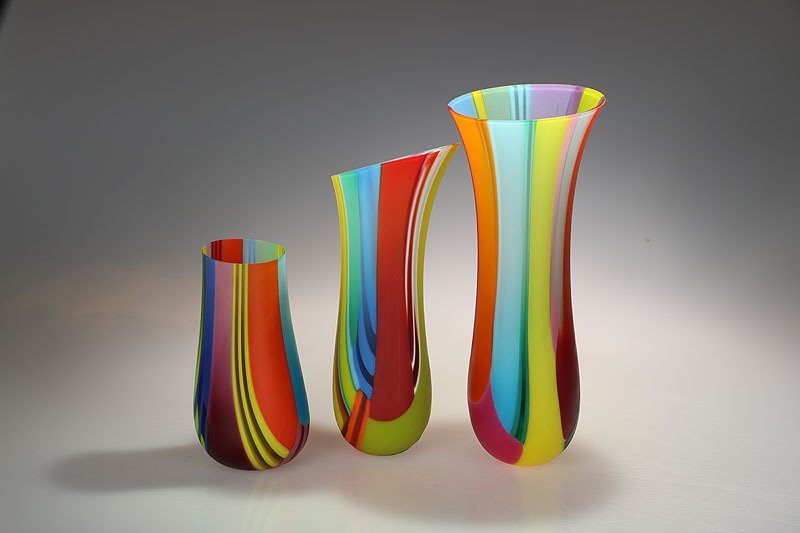 As well as a passion for colour, Ruth is fascinated with the laws of physics when glass is heated in the kiln. She has experimented with gravity, suspending a coloured blank of glass and observing the results as heat is applied, giving it fluidity and movement that is enough to drop it to the floor of the kiln. She has been captivated with this process and is continually experimenting with bigger and deeper drops. Use of vivid dramatic colour has become her work's signature and is still captivated by how light transforms colour into shifting reflections and sparkling translucency. The works illustrated below are intended to give you a taste of what the gallery has to offer, please email us on info@cambridgegallery.co.uk or call us on 01223 324222 to find out which pieces are currently available. Prices range from £72 - £770.